(Nanowerk News) The Southampton Nanofabrication Centre, which will make smaller, more powerful nano- and bio-nano technologies possible, will hold its first open day tomorrow. The Centre, which is housed in the University of Southampton’s new Mountbatten Building, is one of Europe's leading multidisciplinary and state-of-the-art clean room complexes. It is a key element in maintaining the University's global reputation for world-leading research in nanotechnology and photonics. The new building and clean room facility are opening just under four years after the original Mountbatten Building was destroyed by a fire. The £50M of equipment in the new facility will make high-speed, non-volatile and low-power computer memory a reality and make it possible to carry out fast prototyping and to develop smaller, faster and more powerful single electron devices. At a special event at the Southampton Nanofabrication Centre tomorrow (Wednesday 9 September), Professor Ian Diamond, Chair of Research Councils UK (RCUK), will officially inaugurate the Centre’s research in the company of around 200 guests from around the world. Guest speakers include Dr Larry Scipioni, Director of Applications Research, Carl Zeiss SMT Inc.; Dr David Williams, Chief Research Scientist and Lab Manager, Hitachi Cambridge Laboratory; and Dr Chris Winter, Partner, New Venture Partners UK. 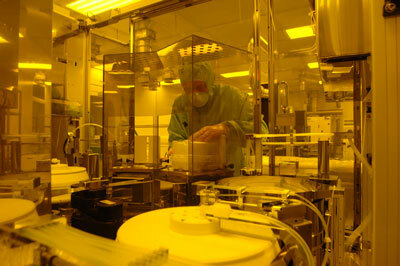 Professor Peter Ashburn of the School of Electronics and Computer Science, Head of the Nano group which will manage the Southampton Nanofabrication Centre, will provide an introduction to the Centre’s facilities and capabilities, and guests will be able to tour the clean rooms in the afternoon. ‘This is a world-leading research facility, which gives us the best possible opportunity to take forward our world-class research,’ said Professor Harvey Rutt, Head of the School of Electronics and Computer Science. ‘We have an outstanding building in the Mountbatten Building and our clean rooms are now fitted out with around £50M of equipment which gives us unique capabilities for the future.